… and it seems they are happening all at once around here. 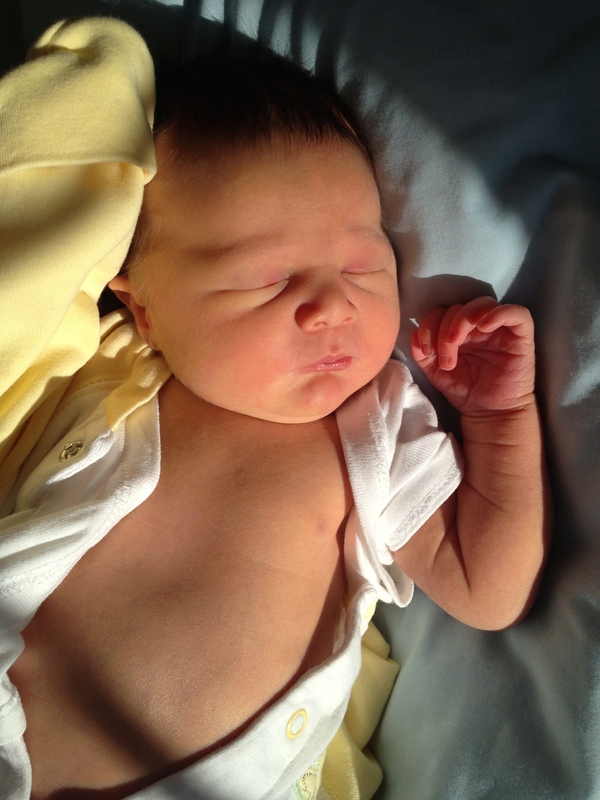 First, say hello to the newest member of our New Hampshire family clan. While our brand new granddaughter and her parents adjust, I have been spending more time with her big brother who is 19-months old and doesn’t quite understand how this tiny new sister can rock his world so. Slowly, daily routines at their household are falling into place. Big bro now gives sis sweet kisses and he volunteers to assist at her bath time. Life is good. 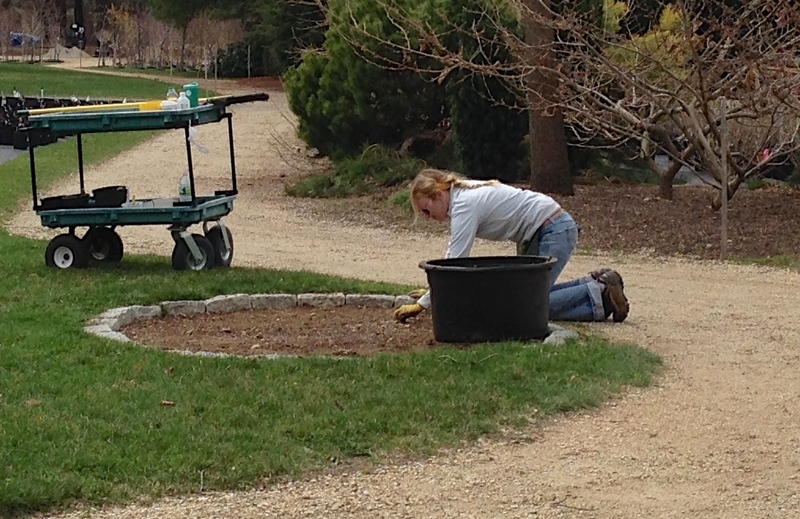 And since my help is not as critically needed as it was 2 weeks ago, I am back to the world of babysitter-on-call, back to a little blogging and back to the world of gardening… which leads me to my next happening. My world of gardening has stepped up a notch from almost nonexistent in a condo to grab a shovel, rake, clippers and get-to-work-all-day. 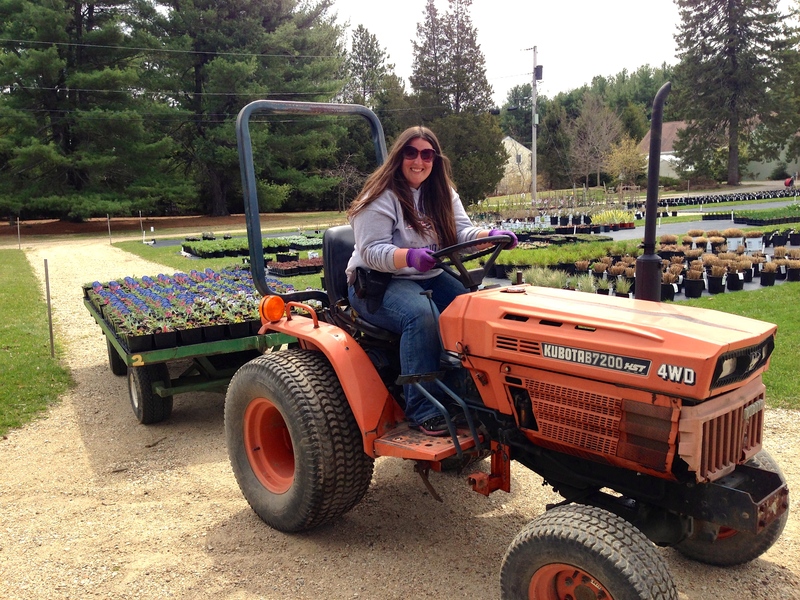 I have returned to part-time work at a garden center close by, Rolling Green Nursery, a gardening business with an earth friendly philosophy. New Hampshire can still be very cold one day and warm the next and wet the next. 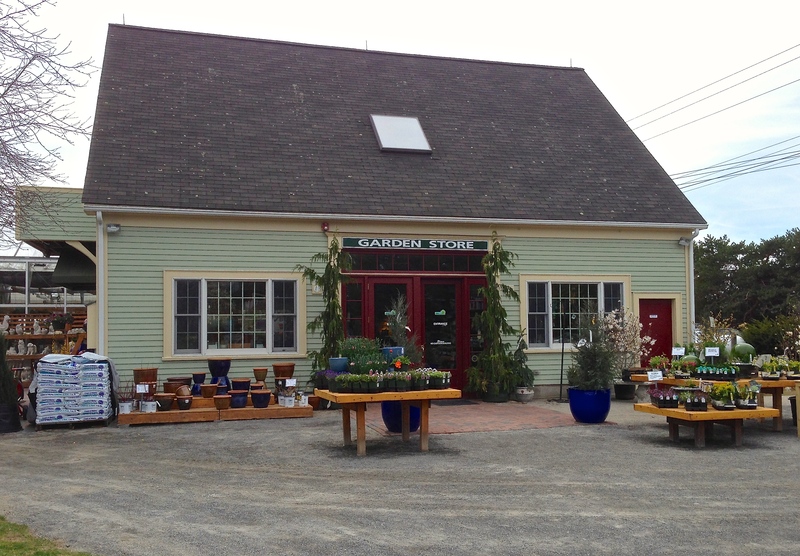 The garden center is slowly coming out of the deep freeze. 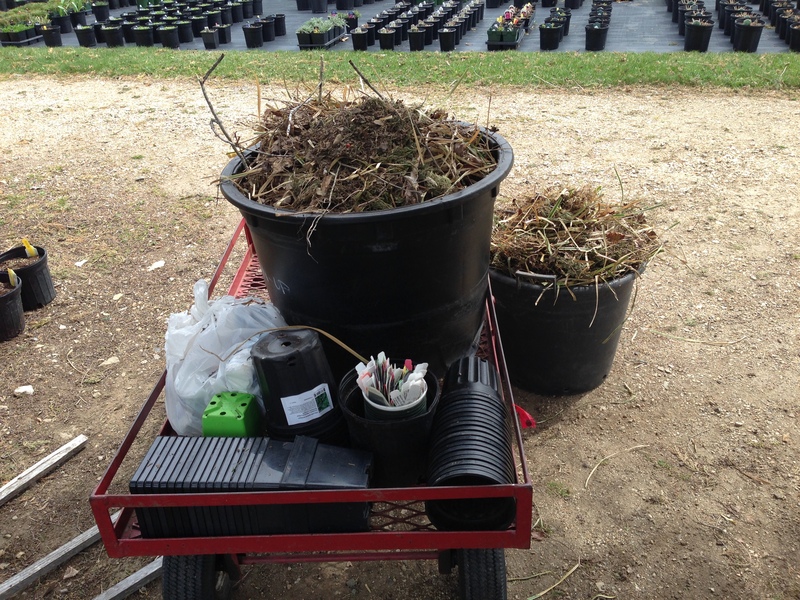 Days at Rolling Green are spent cleaning and preparing beds and transferring tender plants from the greenhouses throughout the grounds. Life is good. 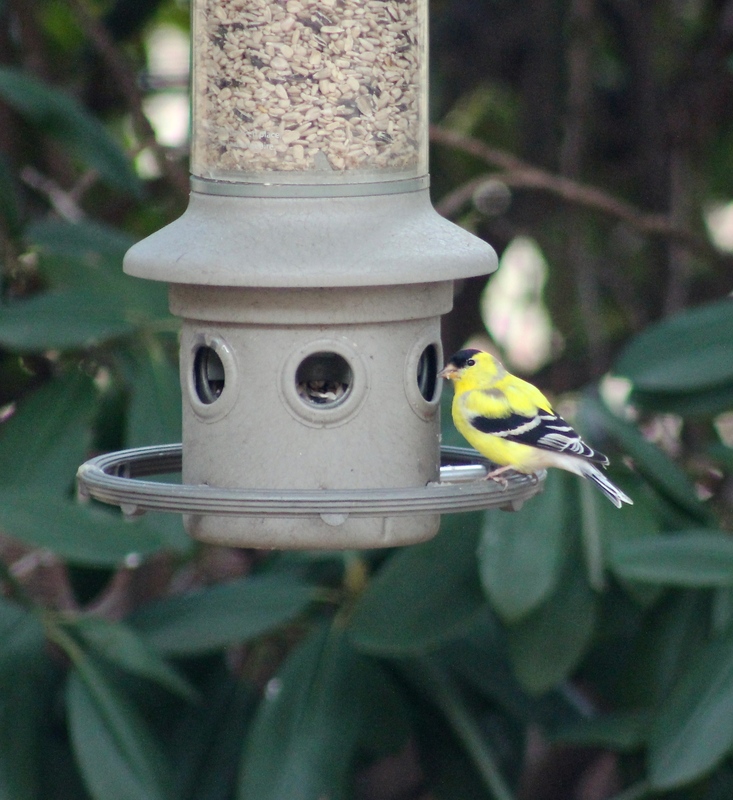 As long as we kept a fresh supply of sunflower and thistle seeds, we saw one or two brave olive-colored American goldfinches visiting the feeder over the winter. Our winter finches have recently been joined by a larger number of goldfinches just returning to the area and, wow, they are a breath of sunshine in their fresh new yellow feathers, a sure sign of spring. The males undergo a complete molt of body feathers in the spring, transforming from drab olive green to bright yellow, their breeding plumage. Our friend below still has patches of drab feathers in spots but by May, he should be fully transformed into a striking bright yellow bird. Breeding begins in June when thistle begins to mature in the fields. “Abundant sunshine” is the Yahoo Weather forecast for today. It is 39° this morning but temperatures will rise to an enjoyable 51° by noon before dropping back to 30° tonight. Forecast calls a welcome warming trend with temperatures pushing into the high 60s on one day early next week. There should not be a flake of snow left on the ground then. 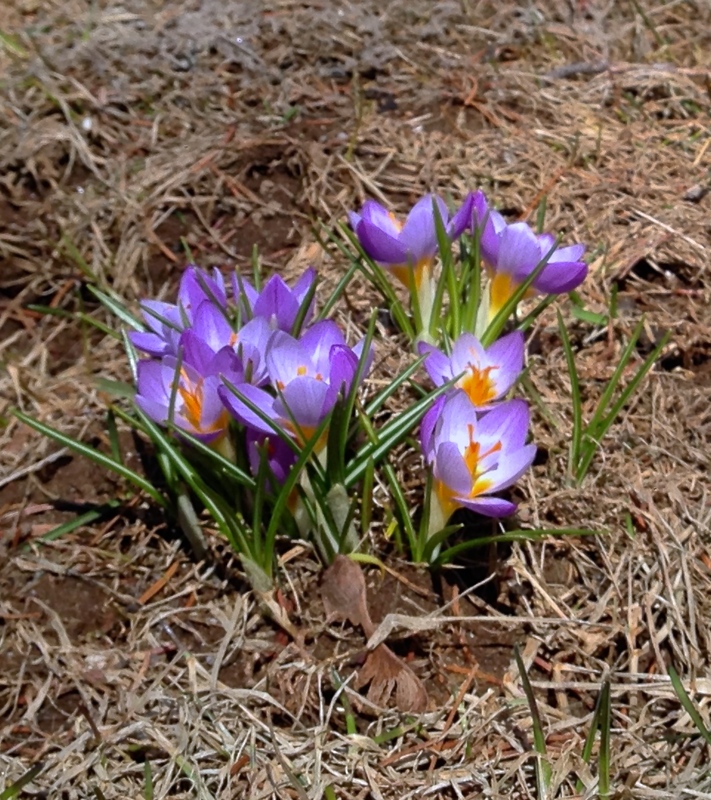 Although we see wonderful signs of spring around the neighborhood like my friend’s crocus below, our home lingers in the shade of tall pines. Where there is deep shade, there is snow. Yesterday I took matters into my own hands and helped some of my newly planted treasures see daylight for the first time in many months. I had no idea what I’d find under the crush of snow and ice but I knew there had to be damage. 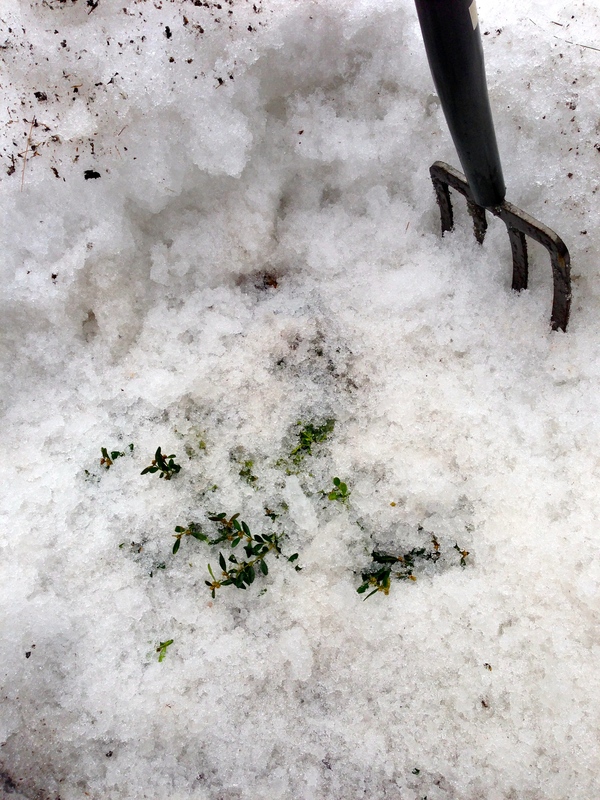 Plants will live but, darn that snow! 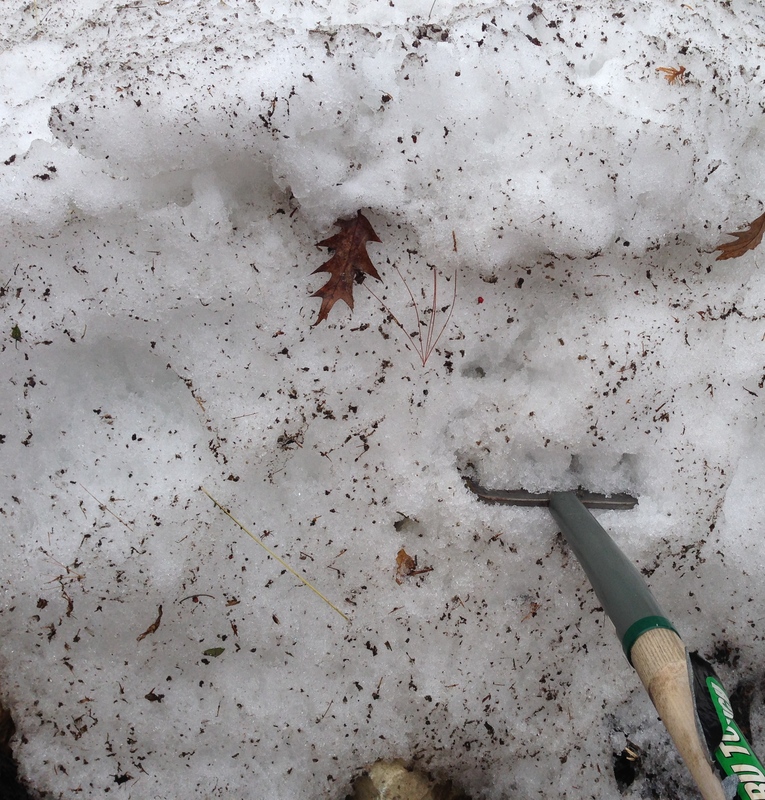 This southern gardener is learning about New England winters. Next fall, the holly below will be tied or wrapped in burlap to protect the shape of the upright growth. 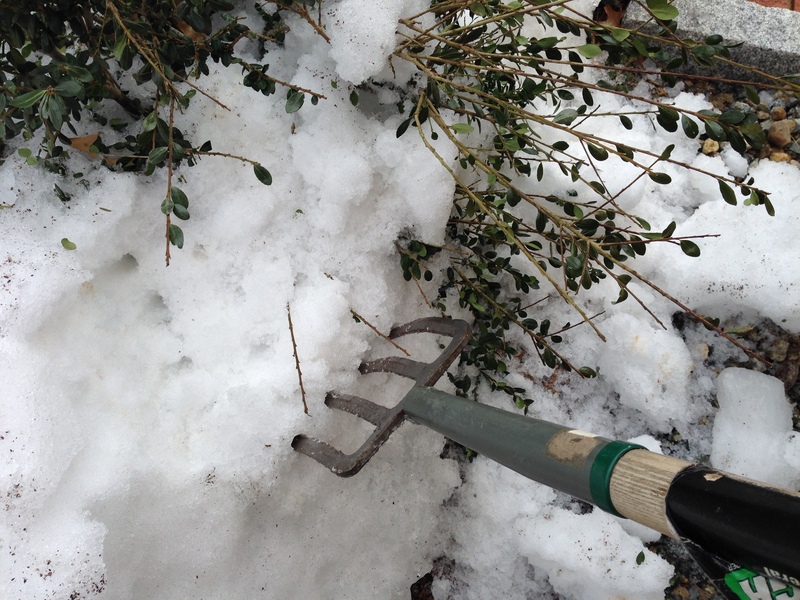 Beneath the snowbank (below), I was most worried about three tiny boxwood I found nearby at Rolling Green Nursery. I fell hard for these dwarf Korean boxwood (Buxus sinica var. insularis ‘Tide Hill’) that were described as ‘rugged.’ The weight of snow from the roof and from driveway and sidewalk clearing was severe in this border. I tried shoveling it off early in the season, but eventually I had to give up trying to minimize or prevent damage to stems. The snow came too fast and too often. Once I located all three shrubs, of course I found crushing damage to the top of shrubs…which is sad as these plants only grow about a foot in height. Thankfully, when handed lemons, my philosophy is to make the sweetest lemonade on the block. Box can be propagated! I carefully removed the stems that were broken, removed the bottom leaves, dipped the stems in a hormone solution, and I’m growing them in a potting mix. 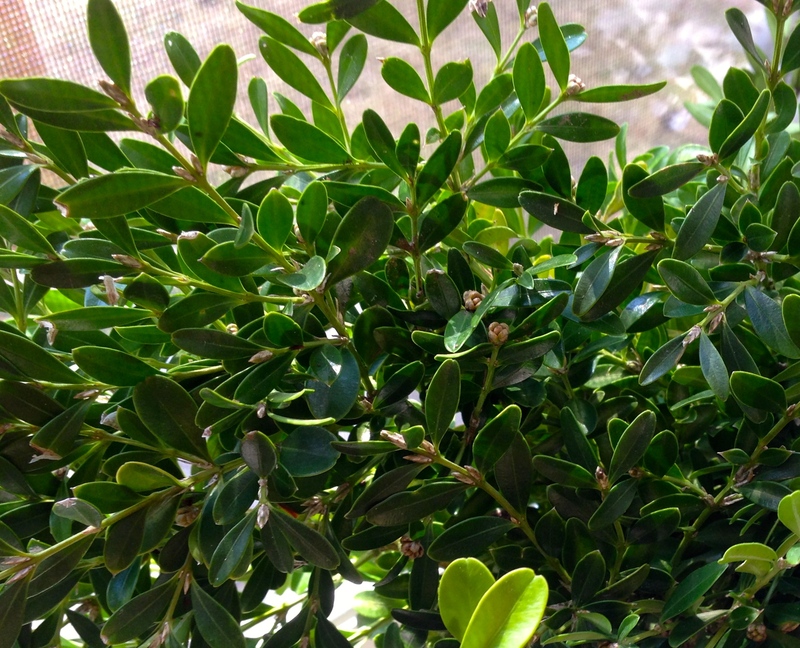 Instead of three dwarf boxwood, I should end up with 8 or 9 babies in about 8 weeks. Who knows? My new landscape plan is to have a full border of these most attractive dwarf boxwood. From our second floor bedroom at 6 a.m. each morning, we carefully pull back the drapes to witness a crowd hanging out beneath our window. A flock of about 15 eastern wild turkeys (Meleagris gallapavo sylvestris) appear at dawn from the nearby woods and gather beneath crab apple and oak trees where retreating snow has uncovered fruit and nuts. The hens get right down to breakfast but the males aren’t at all interested in food. They’re trying to look their best to make themselves more attractive to the females. Yes, we’re right in the middle of mating season. 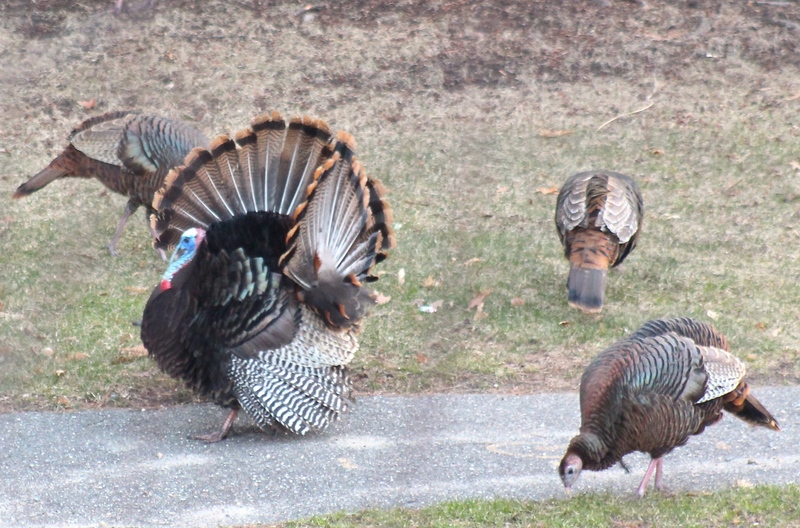 From late March through April, the mating season for turkeys takes place. Tail feathers fanned, iridescent feathers puffed out around the body, head flushed with color, the toms slowly strut in a courtship display dragging their wing tips along the ground around the seemingly disinterested, hungry females. So far these wild male turkeys seem to tolerate one another very well but aggression could mount between the toms in competition for hens. The males have spurs, bony spikes up to 2″ in length, that they use for defense and to establish dominance. We’ve seen none of that so far. 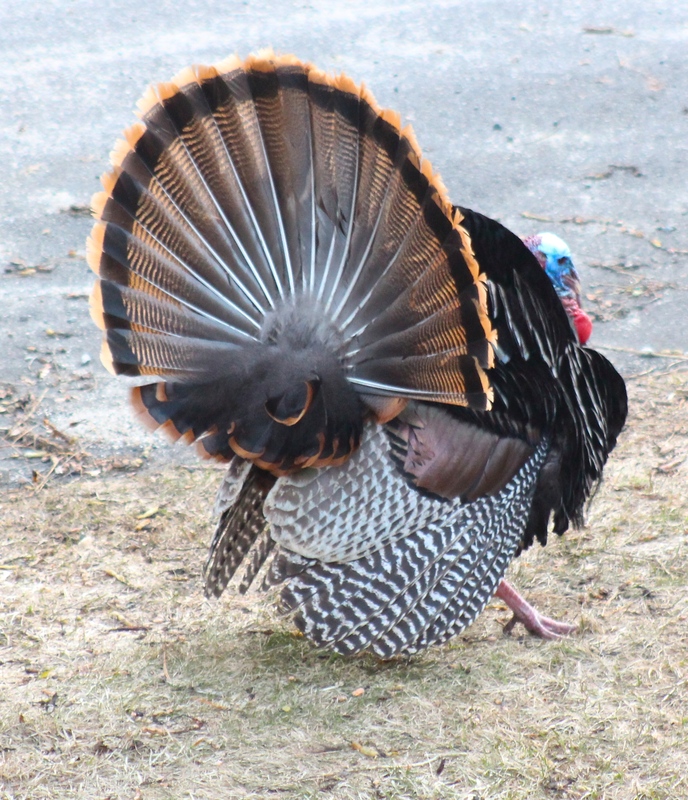 The tail feathers of an adult male turkey are all the same length. The two juvenile ‘jakes’ below display a fan with longer feathers in the center. 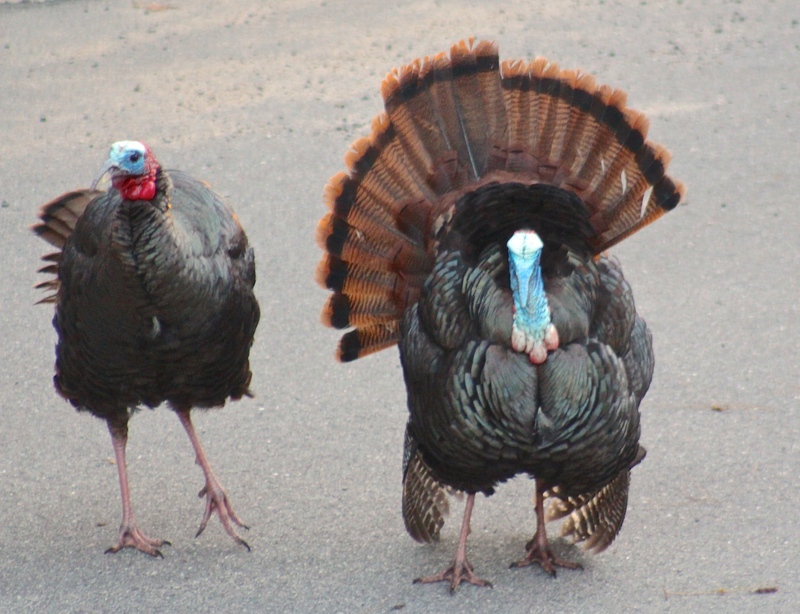 Both practiced their struts and puffing but probably won’t attract a mate this season. We watch the turkey show for about 15 minutes or so, then at some invisible sign the entire flock turns and silently disappears back to the cover of the trees. We all know the turkey population has rebounded from near extinction from over hunting and loss of habitat. 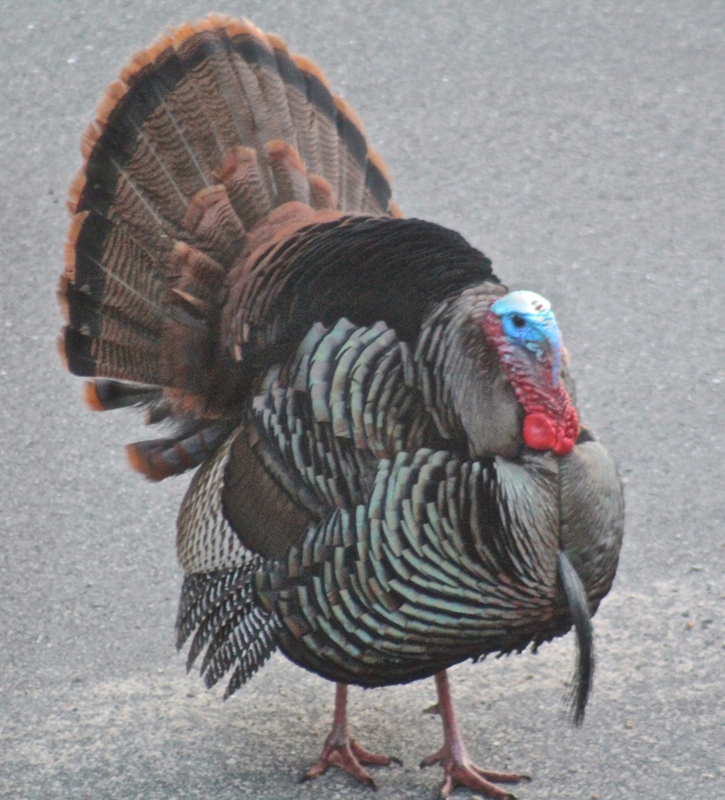 In the mid-1800’s, New Hampshire had no turkeys at all. A small number was reintroduced to the state in 1975 and the birds have thrived. Current numbers of wild turkeys in New Hampshire are estimated at 40,000 and total estimate puts the turkey at 7 million birds nationwide. We’re just happy to have our little flock that we’ve watched mature from last summer return regularly to entertain us at our house.